Learning to Tell the Time with Bubbimals is fun! 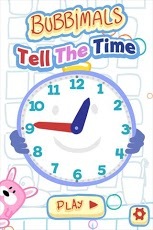 Learning to Tell the Time with Bubbimals is a fun, new, educational way to help children and kids of all ages to learn how to read, interact and play with clocks. 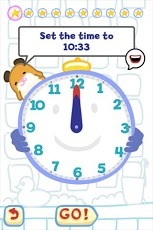 This easy to use app features cute speaking-clock audio in a child's voice alongside fun, rewarding, visual feedback from the cute animated Bubbimals, encouraging your child to learn to tell the time. Parents can easily see how well their child is learning to read the time, understand clock faces, and interactively set the clock's hands. It's simple to use and perfect even for very young children. 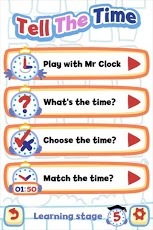 There are four different learning games to play using both analogue and digital clock faces and children. There are five learning stage levels ranging from just the first use of hour hands all the way up to full use of hours and minutes. 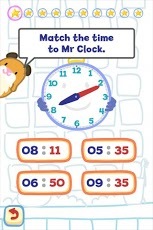 At any time the child can also Play with Mr Clock which allows the child to move the clock hands with their fingers and hear the time played back to them. The voice and written time can also be changed between UK and USA formatted time to help support time learning for as many children as possible. 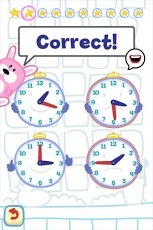 It's a simple, easy fun way to help children to learn to tell the time!